Session 5, titled “East Asian Regional Order in Flux,” explored how states assess the current state of regional cooperation and competition, what the most desirable end point in regional order-building is, and how much of a gap there is between expectations and reality. The moderator of the session, Choi Byung-Il, President of the Korea Economic Research Institute, began by noting that whenever discussions of regional order-building occur in East Asia, the European Union and North Atlantic Treaty Organization are inevitably held up as models. Yet despite South Korea having free trade agreements with Europe and the United States there appeared to be “no bright prospects” for starting or concluding similar agreements with Japan and China, respectively. Matthew Goodman, William E. Simon Chair in Political Economy at the Center for Strategic and International Studies, began by noting that ‘disorder’ or even ‘anarchy’ offered a better description of the current state of regional architecture in East Asia than ‘order.’ He suggested that the creation of a single, unified regional architecture remained unlikely in the immediate future. Nonetheless, each regional grouping creates healthy competition and contributes to enhancing regional dialogue by building habits of cooperation. Dr. Goodman raised concerns about two key divides that were likely to shape the regional architecture in the coming years. The first was the difference between the East Asian and Trans-Pacific approaches to regionalism. While the East Asian approach prioritizes Asian community building, the Trans-Pacific approach seeks to embed the US in the region as well as enlarge its scope. The second divide was between the cooperative and high-standard approaches. The cooperative approach aims to foster functional cooperation among members while the high-standard approach aims to achieve concrete results. Nonetheless, Dr. Goodman emphasized that these two distinctions did not always hold true, as evidenced by US participation in the East Asia Summit as well as Vietnam’s interest in the Trans-Pacific Partnership. Han Sukhee, Associate Professor in the Graduate School of International Studies at Yonsei University, noted that while fundamental chang in the regional order remained unlikely in the near future, there were three major transformations taking place. First, the rise of China is reshaping Sino-US relations and particularly China’s place as a major economic and military power. China’s military modernization and its high defense spending, in particular, will soon narrow the disparity between it and the United States. As both sides react to this change, Prof. Han noted that there was scope for cooperation and competition. Second, Japan’s “Two Track Diplomacy” towards its neighbors was something that required careful observation. On Sino-Japanese relations, Prof. Han cited territorial disputes and the growing rhetoric of military confrontation as damaging prospects for détente. On Korea- Japan relations he noted the face-off between governments and public opinion in Korea as limiting potential for reconciliation. However, he pointed out that despite its sour relationship with Japan, Korea would be unlikely to side with China against Japan. The third issue was Korea’s hedge between the US and China. Amicable relations between Presidents Park Geun-hye and Xi Jinping throughout 2013 were in sharp contrast to Beijing’s ties with Pyongyang. Meanwhile, despite issues such as wartime operational command and nuclear reprocessing, President Park’s visit to the US also highlighted how the overall bilateral relationship seems healthy. Prof. Han noted that an area that required further examination was President Park’s active promotion of Korea’s Middle Power Diplomacy by supporting MIKTA (Mexico, Indonesia, Korea, Turkey, and Australia). Wang Yiwei, Deputy Director of the Center for EU Studies at Renmin University of China, described the current regional order in three words: Exclusive, Unbalanced, and Unsustainable. First, Dr. Wang pointed to the continued dominance of a traditional Cold War security order that excluded China. While China has actively participated in regional forums and groupings, it cannot compete with the US-led hub-and-spokes system. He pointed to the exclusive nature of groupings such as the TPP, where even Vietnam has been invited, yet China has not. Second, the unbalanced nature of the current order was that despite being the largest trading partner of every country in East Asia, economic ties between China and the region had not extended into areas such as investment and other financial areas. Furthermore, the US retained a disproportionate influence on the region’s economic livelihood as evidenced by the damage that the quantitative easing by the US Federal Reserve had on developing Asian countries. Finally, Dr. Wang stated that the order is unsustainable because so many of the public goods that the region needs for its prosperity are dependent upon the US. As the global financial crisis showed, questions of reliability will continue to endure. Dr. Wang proposed that China, ASEAN, Japan, and Korea must do more to contribute to regional public goods. Furthermore, he argued that no future regional order was possible without the inclusion of actors such as China and Russia. Zhang Tuosheng, Senior Fellow and Chairman of the Academic Committee and the Director of the Center for Foreign Policy Studies at the China Foundation for International and Strategic Studies, next spoke on how the current regional order was composed of four parts: interdependence based on bilateral and strategic partnerships, major power cooperation and coordination, developing multilateral dialogue mechanisms, and bilateral military alliances led by the US. Mo Jongryn, Director of the Center for Global Governance at the Asan Institute for Policy Studies, began the discussant section by questioning the underlying assumption that there was something inherently wrong with the current regional order. Noting that the past forty years have largely been beneficial for the entire region, Prof. Mo suggested that in the push to achieve an overly ambitious change, we may end up ruining the achievements that have been made. He ended by commenting that regional solutions are not the only mechanisms available and that bilateral and global forums could also be productive. Yoon Young-seok, Member (Saenuri Party) of the National Assembly of the Republic of Korea, commented that the US pivot to Asia is based on two factors: the rise of China’s economic, military and diplomatic capabilities and the declining importance of the Middle East to the US since the development of shale gas. Reminding the audience that nuclear weapons rendered a military confrontation unrealistic, Rep. Yoon argued that pragmatism would define the relationship. He suggested that middle powers like Korea should not wait for the major powers to reach agreements, but be more proactive on their own. Finally, Zhao Minghao, a Research Fellow at the Charhar Institute, raised two questions for the panel regarding the regional equilibrium and China-US dynamics. 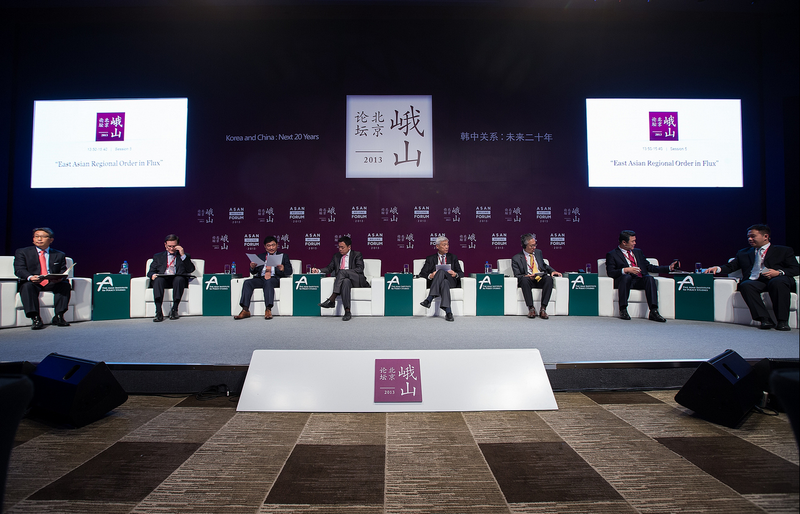 Describing what he called East Asia’s “messy multilateralism” and “demand for order building,” Dr. Zhao highlighted how all countries are making their own rebalancing moves to adjust to broader strategic change. Commenting on Prime Minister Shinzo Abe’s approach, he characterized it as a “dual-hedging strategy” against China’s rise in the short-term and US decline in the long-term. He noted that countries such as Korea were instead playing a bridging role between China and the US. During the question and answer section, the subject of identity as a continental, land-based power or an oceanic, sea-faring power was prominent. Dr. Wang pointed to the rise of Eurasia as a new strategic environment that merited Korea’s attention as a continental power. Dr. Zhang meanwhile questioned whether the US and Japan would accept China as a maritime power. He noted that China, Japan, and South Korea all have an interest in protecting sea lanes from the Middle East or even shale gas from the US. There is scope for the Chinese PLA Navy to participate more actively in maritime patrols. On the dichotomy between cooperation and competition, Dr. Goodman suggested that viewing the two as incompatible was not particularly helpful. Instead, experts needed to seek out shades of gray where there was opportunity to engage.